BERGGER BER49 is highly recommended for manual development. Nevertheless, it is also usable in automatic machines. 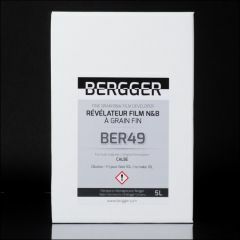 BERGGER BER49 can be compared to the old and discontinued legacy developers:AGFA ATOMAL, TETENAL EMOFIN or KODAK MICRODOL-X. BER49 allows to obtain very detailed negatives, with unrivalled shade of greys.